AT MAXXMUSCLE 100% OR NOTHING™, WE PRIDE OURSELVES IN THE QUALITY OF OUR PRODUCTS AND OUR CUSTOMER SERVICE. Have a look at the information provided in the list, and if you can’t ﬁnd what you are looking for, or would like to get in touch for any other reason, just drop us a line using the Contact Page. Protein: every hard training Bodybuilder and Athlete knows that we need more protein than a regular person to perform, recover and grow. Getting enough Protein from solid food sources is tough. This is where a quality protein supplement comes into play. Notice I said "Quality"! There are so many inferior protein products out there on the market now. Remember, it’s not how much protein you consume, its how much you ABSORB! Just because you drink a shake with 50g of protein, doesn’t mean you will absorb most of it if it is from poor sources such as soy, calcium caseinate & low-grade whey concentrate. Tactical Whey is a blend of high grade whey concentrate, Isolate and Hydrosylate for maximum absorbtion. To enhance absorption even further, we have raised the bar with the addition of Cavacurmin and MSM which promote gut health, enhanced immune function and have Anti-inflammatory benefits within the body. Tastes and mixes amazing, with an amino acid profile that is off the chart - including a high dose of L-Leucine per serving to trigger Muscle Protein Synthesis (MPS) and the elusive Mtor pathway. I wanted more than just a regular protein powder, and this is it! 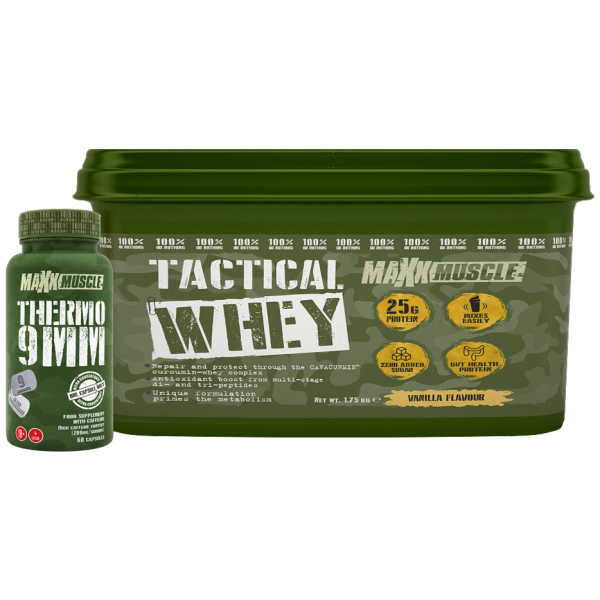 Tactical Whey: the ultimate protein blend to add to your arsenal for the battle of a better body.